Sugar Shane Mosley turned 37 last September. He was known for his smooth style and hand speed. He has big fight experience and used to be compared to his predecessors named Sugar – Ray Robinson and Ray Leonard. He used to be ranked among the top three pound per pound fighters in the world. But his power declined when he moved up in weight. He has won world titles at 135, 147 and 154 lbs. He does have two victories over Oscar de la Hoya. The last one in 2003 was not just for the WBC/WBA titles but also for the historically linear world junior middleweight title. Unfortunately Mosley was never able to cash in on this having lost to Ronald “Winky” Wright twice in 2004. After the twin losses to Wright, Mosley went on a career rebuilding process in 2005 that had him move down back to welterweight. It was during this time that Antonio Margarito started getting noticed. He won the vacant WBO welterweight world title in 2002 with a 10th round stoppage win over Antonio Diaz but it was his February 2005 televised fight with Sebastian Lujan that shocked fans as Lujan’s left ear was literally peeled and falling from the side of his head after 10 rounds which lead to a TKO win for Margarito. For the next two years, Margarito’s relentless style terrorized the welterweight division before losing his WBO world title belt to Paul Williams by unanimous decision last July 2007. But in April 2008, Margarito took the IBF welterweight title from Kermit Cintron then relinquished it to face then WBA champ Miguel Cotto. It was his 11th round KO win over Cotto that once again placed Margarito in the mix for big money fights. 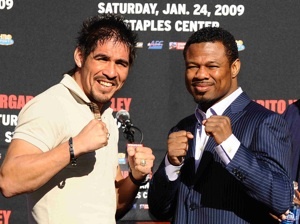 Margarito was one of names being floated around as Oscar de la Hoya’s opponent for his December 2008 fight. The Golden Boy took a lot of criticism for side stepping Margarito and picking a smaller Manny Pacquiao. We all know what happened after that. Mosley scored two significant victories over Fernando Vargas in 2006. But in November 2007, he lost to Cotto by unanimous decision. He bounced back in September 2008 with a 12th round stoppage win over the highly entertaining Ricardo Mayorga. The 30 year old Margarito (37W-5L) is now the main man in the 147 lb. division and his 14 year pro career is now on the upswing. For years he has endured being avoided by boxing's big names. He certainly relishes being a headliner and meeting a name fighter like Mosley. We may even get to see him face Manny Pacquiao before the year ends. Mosley (45W- 5L) - who turned pro 16 years ago - has not held a world title for almost five years. Like all aging ex-champs, he is at a stage where boxing pundits raise questions as to whether he should call it a day or does he still have one great performance left inside him. Will he still have the vaunted speed and power needed to tame the Tijuana Tornado? These questions will be answered in 2009’s first important bout held at the Staples Center in L.A., this January 25 Sunday morning Manila time.